The sun sets over the hill to the west on the last evening of our holiday in Zakynthos. 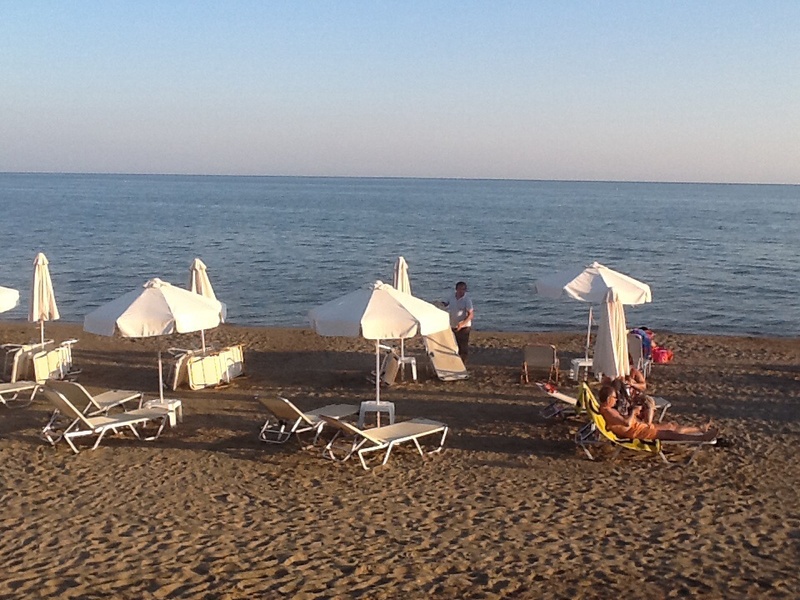 Shadows are cast along the shore as the sun beds are folded away and umbrellas are pulled down. Footprints in the soft sand are a sign of the many people that have passed this way today. The cool of the evening is very welcome after a hot day. I believe anyone coming to this beach will leave rested, healed, beautified, blessed, rejuvenated, refreshed and restored. He leads me beside still waters to restore my soul. I thank God I am alive to enjoy the goodness of God in the land of the Living. We have met people from different nationalities, German, Russian, English, Greek, and Austrian. We have met young and old, from the babies and toddlers to the two eighty something year old couples that were our neighbors at the poolside. We could not communicate but we all were enjoying the warmth of the sun on our bodies in the silence. A swim in the sea is welcome to cool our bodies. It is no effort to swim in the salty, still, shallow waters. The young and not so young, able bodied and not so able bodied, buxom and slim alike, bodies modestly covered and others less well covered take a dip. This is a favorite beach not only for sunbathers but also for Turtles. The females lay their eggs high up on the beach in May and the young hatch out in October. 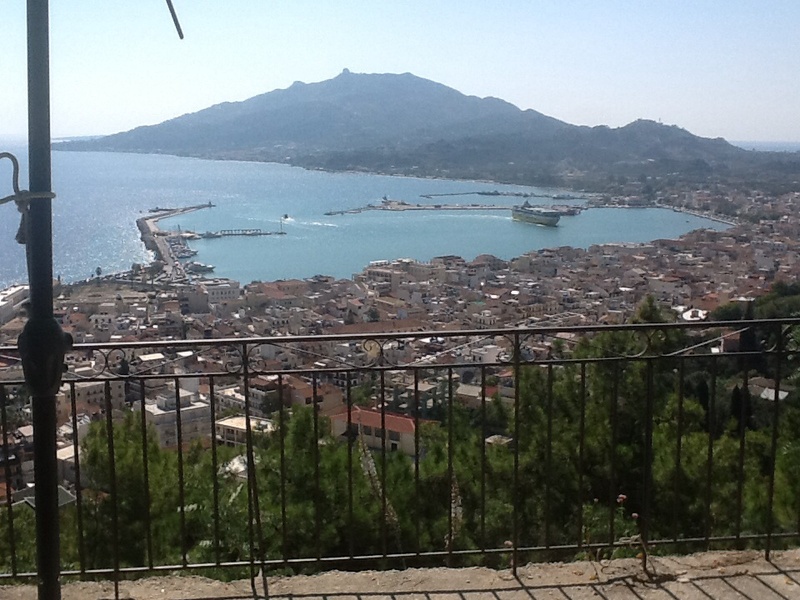 Earlier today our friend brought us to a faviourite restaurant, high above the town of Zakynthos. We enjoyed the glorious view, the red roofed houses below, and the blue bay shimmering in the sunshine beyond. A Ferryboat from the Greek mainland announces it’s arrival into the harbor with a loud horn blast. We watch it dock. Other boats are dwarfed by this new Ferry. We return from this haven to the hear of the turmoil in the nations. A new Labour leader has been elected and some countries of Europe close their borders to Immigrants. I will keep looking to Jesus, like Peter in the storm. He could walk on the water as long as he fixed his eyes on Jesus.